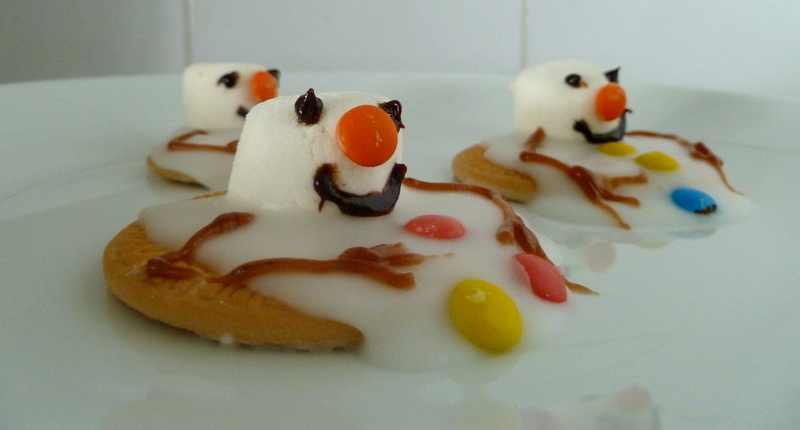 As you may remember, Ickle and I had intended to make Melting Snowman biccies* for our playgroup end-of-year party. Well, we finally got around to it for our Christmas street party by the lake. And it was, without a doubt, our most successful kitchen session to-date. “Why was that?” I hear you ask. For a start, we kept things simple. First, we bought our biscuit base. Second, Ickle was able to participate in every stage of the decorating process (mixing and drizzling icing, sticking marshmallows and M&Ms onto it, and squeezing the tube of writing icing). Last, and most important, perhaps, was the presence of treats on the kitchen counter within Ickle’s reach. The possibility of sampling a pink marshmallow or mini M&M before the biccies were ready to eat kept her interest up from start to finish. We followed this recipe, although used writing icing for the arms in place of pretzels. I’d go for the pretzels next time. Much more twiggy. Melting Snowman biccies are definitely not for those that like their end product to be pretty and pristine. The M&Ms sank into our icing and leached food colouring into the white sugar; and the icing itself ran off the biccie onto the plate. 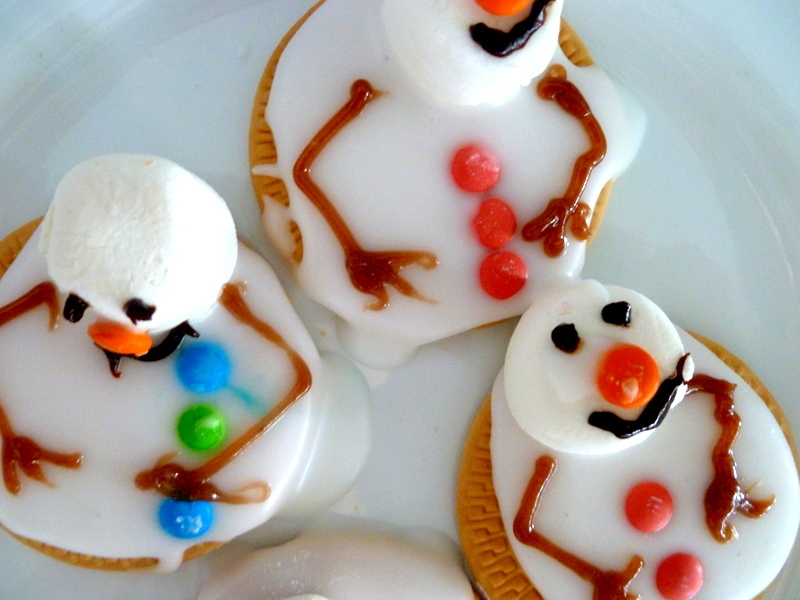 But – think about it – a melting snowman is a bit of a sorry sight, and I bet a real one wouldn’t taste half as good as our festive biccies. *A very appropriate choice for Christmas in Australia. Now, how long would a snowman last out here in December? This entry was posted in Food and tagged M&Ms, marshmallows, Melting Snowman biccies, pretzels on December 30, 2014 by Laura. It was Ickle’s Christmas party at playgroup yesterday, and all the kiddies had been asked to bring a plate to share. My original plan was to make Melting Snowman biccies with my little helper, but things didn’t go according to plan, so we opted for Watermelon Christmas trees instead. What a great find! They are so easy, especially when time is of the essence. I followed these basic instructions, not that a step-by-step guide is really necessary. 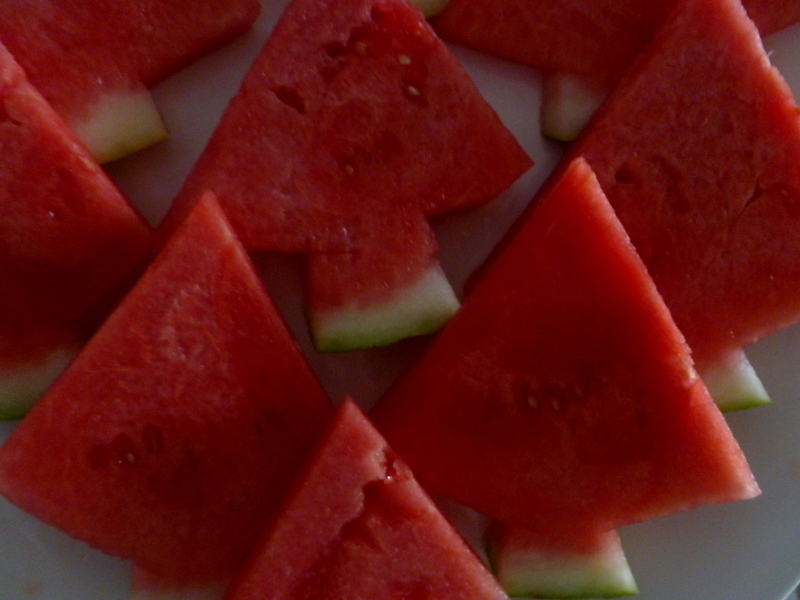 Watermelon Christmas trees are the ideal healthy treat for a hot summer’s day – just perfect for the festive season in Oz. The kiddies devoured the lot! 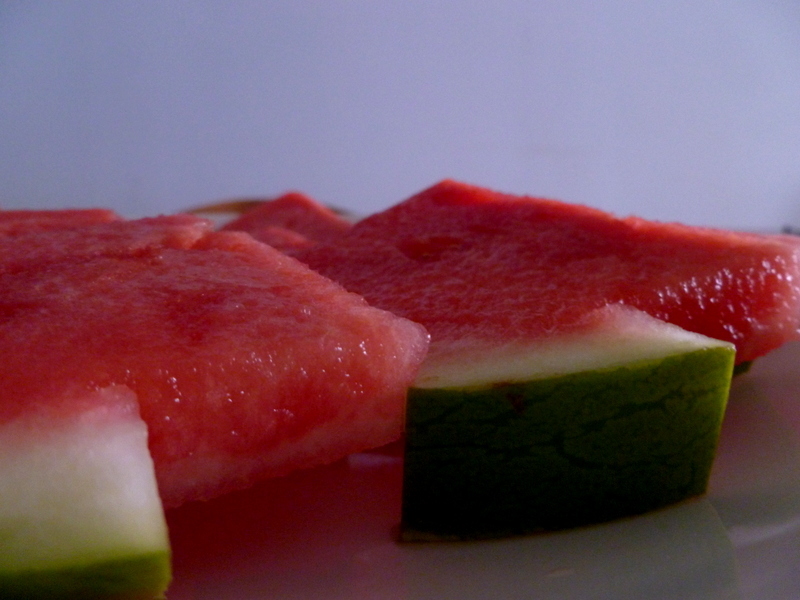 This entry was posted in Food and tagged Melting Snowman biccies, playgroup, watermelo, Watermelon Christmas trees on December 10, 2014 by Laura.